I do not follow the cult of the celebrity (chef or otherwise). This means that I do not follow famous chefs around (the internet, or their restaurants) worshipping at their feet. This means that just because the words “pop-up” or “underground” are used I will not fawn all over it. 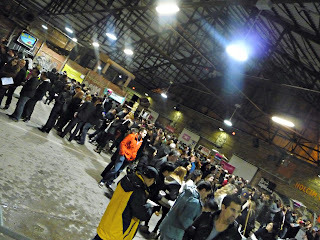 I volunteered at the Toronto Underground Market (TUM) to see if the event was worthy of the buzz surrounding it. The information emailed to me was lacking. There was very little information on where to meet with no signs guiding the way. The email insisted on early arrival but information was not passed on to volunteers for 30 minutes after the stated arrival time. Volunteers were very badly managed with very little organization. Organization sets up volunteer accountability. More than a few volunteers simply disappeared into the event where a free drink ticket and free entry was granted to volunteers. The event is held in Evergreen Brickworks, an organization with clearly stated environmental guidelines. While TUM has both garbage and recycling bins they do not recycle. Contents of both bins are thrown into the same dumpster. Additionally, volunteer safety is not considered as volunteers had to walk through a dark parking lot to the dumpster. The event is well attended, usually selling out, but I did not enjoy it. People around me were excited by pedantic items such as coconut marshmallows. They lined up for an hour to get a taco. By the end of the night most people were drunk. The event seems like an excuse to drink heavily and eat to excess. TUM is an exercise in personal gluttony. I wanted it to be an exercise in palate development. However, TUM is not without merit, it's ideals are to help fledgling food businesses gain a foothold in a difficult market. Which is certainly something I can get behind! Check it out at TUM.